If there is a Dr. Frankenstein of the shooting world, it is the AR-15 owner. We love to accessorize, modify, and reconfigure our AR-15s. We shorten barrels and switch handguards. We cycle through optics, transplant buttstocks and grips, and change calibers like mad scientists. And then . . .
. . . and then we come to the trigger. The trigger is the heart of the shooter’s interaction with his rifle. We want the best possible triggers in our rifles, but in the pursuit of perfection some shooters to commit horrible crimes against their triggers. In the end, it’s the shooter who pays the price for this. So you are a pretty good kitchen table gunsmith. You understand the AR-15, you even understand how the trigger works. You know what positive, negative, and neutral engagements are, and you know how to identify each. You know the theory behind trigger jobs, how they are done, and what tools you need. Hold ON! Don’t pick up that stone or file yet! Unless trigger jobs are what you do, don’t mess around with one-off trigger jobs once in a while. It isn’t worth the risk. You run the risk of ruining parts, creating a dangerous trigger, or creating a nonfunctioning trigger. Better than most, I understand how triggers work on many firearms. I have studied trigger jobs and know how to do them. And how often do I do trigger jobs? Never. I never do them. Most standard AR-15 triggers are surface-hardened. You may take your fine files and stones to an AR trigger and get the smoothest, lightest trigger ever. Perfect! But you cut through the hardened surface and now wear is accelerated. Then one day that perfect trigger becomes a really scary trigger, and you never saw it coming. So you let him take the rifle home and a few days or a few weeks later he brings it back. Sure enough, the trigger feels pretty good. You don’t really know what he did with it, and never really think about it, but it works fine for years and you forget over time that anyone even messed with the trigger. The rifle gets dirty, gets cleaned. Maybe some oil gets a bit old and goopy in the lower. Though you don’t notice, it mixes with some copper shavings and carbon. Then one crisp frosty fall day, or maybe one really hot day, the thing goes, “BANG!” when you least expected it. Or it fires on safe when jarred. Friends don’t let friends work on their triggers. There is some good information on YouTube. There is some pretty bad stuff on there, too. I have seen some crazy YouTube trigger job tutorials, and some decent ones for guns other than AR-15s. Can you tell the difference between fact and fantasy YouTube trigger job tutorials? And I’ll give you a hint – the comments don’t help. Doing a trigger job while watching some random guy on YouTube tell you how is like doing a root canal with a Dremel tool while watching an actor who plays a dentist on TV. Switching out springs is so easy, even a caveman could it. While not necessarily bad, it may lead to problems. For triggers you can buy heavier springs or lighter springs. You can buy them from different manufactures. The hard part is understanding what the change will do. Everything in the rifle interacts with something else. The trigger interacts with the hammer, which interacts with the disconnector, the firing pin, and also the bolt carrier. The bolt carrier interacts with the bolt, buffer, upper, cam pin, firing pin, gas tube, even the magazine sometimes, and we could go on. So when we start switching springs, we start changing how different systems within the rifle interact, and we can cause unexpected and sometimes hard to diagnose functional issues. One of the first things I ask when an AR isn’t functioning is, “What springs are in it?” If the owner switched out springs, the springs get switched back and the rifle tested. Often this fixes the problem. Just recently I resolved an issue with a rifle in which one spring in in the trigger group caused the rifle to short-stroke. Springs within a firearm often balance each other and certain parts. When you start changing springs, you can upset the balance. Now you’re convinced AR-15 trigger jobs are a bad idea so the path forward is clear: Just pick up an aftermarket trigger and put it in. You’re on the right track, but slow down and think for a minute. The problem with aftermarket triggers is that there are so many. Which do you chose? For hunting or defensive purposes (and for ease of installation), I like to keep them simple. I avoid triggers that are complicated and look like the workings of a Swiss watch. Delicate, complicated and very expensive triggers are fine for some competition shooting, but for hunting and defense, simplicity and reliability are what we want. I also avoid triggers that require adjustment in the installation. Some can be quite difficult to adjust, or simply very inconvenient, and a lot of shooters never get them adjusted correctly. 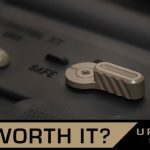 Finally, I want an established manufacturer, not the latest company to start making triggers, and certainly not the cheapest. When looking for an aftermarket trigger, you don’t have to buy the most expensive, but don’t buy the cheapest thing out there. Don’t mess with triggers that need adjustment or that are complicated to install – look for something that drops in easily. And don’t buy a certain trigger just because it is the latest thing that all the guys on a forum or social media are raving about. Chances are, they don’t know anything about triggers and are just jumping on the hype bandwagon. There is only one thing I do to improve an AR-15 trigger: I replace it entirely with an aftermarket trigger. I have used a variety of aftermarket triggers from a number of different manufacturers and installed many more in other people’s rifles. When buying an aftermarket trigger, I want something that I know will be a true drop-in installation, and have the quality and precision build to be consistent from trigger to trigger, rifle to rifle. Nothing frustrates me more than installing several of the same brand and model of trigger and finding that each is different than the others. Last month I installed aftermarket triggers from Timney in two rifles. 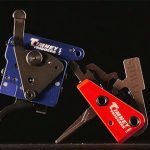 Timney triggers drop in with no need to adjust or assemble the trigger group. Every trigger is mounted in a lower and tested by a real person prior to leaving the factory. Timney has a proven record, and their performance is consistent from trigger to trigger. They are not the most expensive, nor the cheapest, but they are good, solid triggers that offer everything a hunter or shooter needs – light crisp reliable triggers and easy drop-in installation as a complete unit. With triggers like that readily available, there’s simply no justification for doing a Frankenstein job on your trigger. There’s no reason to replace reliable function with uncertain outcomes. Don’t be that guy. Be the guy who does it right, who is never embarrassed, endangered or worse, as a result of an AR-15 trigger job gone bad. .458 SOCOM AR-15 Overbuild – The Ultimate Big Bore AR? This entry was posted in Wilderness Tactical Hunter - Dylan Saunders and tagged AR-15, AR15, Timney, Trigger, Upgrade by Dylan Saunders. Bookmark the permalink. I got a Timney trigger for my M77. Other than being adjustable for creep it was no better than the (terrible for a bolt action) stock Ruger trigger. Also, it required custom fitting of the safety. What a waste of money. Perhaps the AR triggers from Timney are better, I haven’t bought one. May I suggest you call up Timney and ask about your experience? I’ve used Timney triggers for a long time, longer than I’ve worked in the shooting/hunting industry. I have yet to be disappointed, regardless of the gun platform (thought I’ve never run an M77). The people at Timney take a great deal of pride in their work and I imagine they’d really like to hear from you personally. Thank you. I am new to the AR world and just did a polish job on my AR using a rotary tool and white polishing compound. After reading your blog I am going to pull it out and buy a new one. I sure dont want it going BANG when I don’t comand it to do so. Thank you. I am new to the AR world and just did a polish job on my AR using a rotary tool and white polishing compound. After reading your blog I am going to pull it out and buy a new one. I sure dont want it going BANG when I don’t comand it to do so. Thanks Again!! Glad we could help! There are lots of aftermarket triggers that are less work to drop in a shoot with than what you just did. Great call on your part and I bet you’ll love the difference! Maybe post to our Facebook page about your experience once you put a new trigger in there? Thanks for being part of the SHWAT™ Team! Rem 1903A3. After inadvertent discharge at a rifle range, (in a safe down range direction) the problem was found to be a tampered with t————-y trigger. Sear engagement was minuscule, about 0.010 inch estimated. Sear surfaces not after market polished, but rounded on the tiny worn areas. Pull weight adjustment screw was binding and past cross threading was evident. Adjustment locknuts battered. Pull weight measured 4 oz. to 15 oz. depending on the force against the striker block. Replaced it with a Dayton Traister factory new trigger. This first firing of a gun show pick up did not end badly, but certainly could have been very bad. Can give it back to my nephew now. What data is there to show that trigger jobs are bad? There’s no data to back up your claim. Check out the book Gunsmithing: Rifles by Patrick Sweeney, page 69, under trigger work. There is a description of the issue in that book. Also, check out any of a number of good armorer’s courses, in which the same information is usually included. The course from AGI is easily to find (you can order it directly from AGI on a DVD). 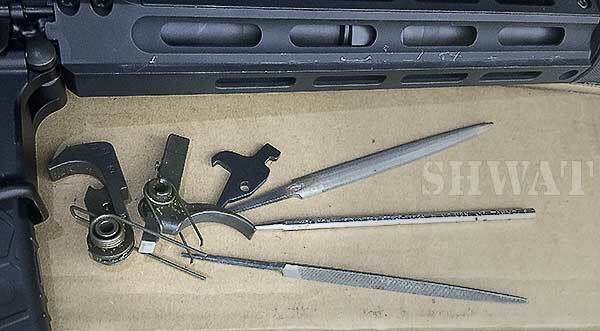 As mentioned in this article, this is common to most stock triggers on AR rifles. Trigger jobs are not bad as a rule, but on certain triggers, they can be. Also, they should only be done by someone trained and skilled in doing trigger jobs on the particular type of trigger. Amateur trigger jobs can have really bad results. I have personally spoken to firearms manufacturers who have told me that almost all firearms with malfunctioning triggers that were returned to them over the years had had botched trigger jobs, often performed for the owner by a gunsmith. If you were not selling a trigger assembly your article would hold more weight. That’s an odd comment. We don’t sell triggers. We do have some shirts for sale at SHWAToutfitters.com though! This is some really good information about caring for your gun. It is good to know that you should stay away from triggers for your gun that needs adjustment in the installation. It might be smart to get a gunsmith to help you with that if you do get one of those triggers. Then someone should sell a better sear and hammer. Not everyone wants a 300$ trigger when a New Hammer and Sear with a lower pull will do the trick with a trigger Spring. So you are saying don’t buy an aftermarket trigger and then to also buy an aftermarket trigger. Sorry bud but a gunsmith is going to stone and file your trigger the same way a kitchen table gunsmith would. That professional gunsmith just has more experience at the table than you do. Not to mention that the case hardening requires a certain type of bit to even drill a hole in it. Your polishing isn’t going to touch the hardening in any way to completely remove it and compromise the integrity of the metal. Thanks for asking! I didn’t say not to buy an aftermarket trigger, I said to be careful about which you choose. There are a lot of aftermarket parts out there, and they vary greatly it both quality and purpose. I just installed an Alexander Arms trigger with the blade configuration in a new .50 Beowulf pistol. It is a great trigger, and the blade shape can be felt through gloves, so I have better control in cold weather. It is light and smooth with no overtravel or take-up, yet not so light that a less experienced shooter will have a chance of doubling due to the recoil. It is the right trigger for the purpose. Other rifles have Timney triggers installed, each one with the trigger chosen for the purpose. I am about to put a Timney trigger in a precision bolt rifle build, while I keep the issue triggers in my K31 rifles because those triggers are excellent. There are many professional gunsmiths that do not follow the best practices. I have repaired many firearms that have been damaged by professional gunsmiths, and skill, training, and ethics vary from gunsmith to gunsmith. Most scopes that have been installed on my customer’s rifles by gunsmiths have been damaged by incorrect installation. Many are installed incorrectly or in the wrong place, and it seems a common trend for gunsmiths to put red loktite on the scope ring screws. I have had 1911s in my hand that have had new safeties installed by respected gunsmiths, and they would fire when the safety was moved to the fire position. Because a gunsmith will stone and file an AR trigger does not mean he should. There is a difference between cutting metal with metal (drill bit) and cutting metal with an abrasive. I can cut steel with a stone that can’t be touched with most bits without annealing. You have a line on how to get a check from Timney? You should cash it. Our Publisher used Timney triggers long before SHWAT™ was ever thought of. We like them, we have a positive connection, but they only sponsored SHWAT™ for a moment in our history. Want to know how all that actually works around here? Check out our 411 page where you’ll find our Ethics Statement. Nobody wants to work for free, but in our business it happens all the time. There’s nothing wrong with doing your own trigger job, if you’re competent. Even with case hardening you’re still looking at about 1.5 mm of hardened material. If you’re removing even 0.5 mm then you’re removing too much. Maintain geometry, use the correct stones, remove a minimal amount of material, check your work and apply some real care then there’s no reason this isn’t safe. It’s on you, of course, to ensure your work is safe but to think that the only people who can do this are ‘professional manufacturers’ is nonsense. Personally, I only treat the sear face on the trigger, I check my work in a trigger jig and I use stock springs. Nope, not a Geissele trigger but it sure feels a hell of a lot better without the 150 grit finish that these stock triggers normally come with.